Digital Transformation is all the rage. It’s a little like virtue: everybody is rooting for it but few can actually articulate what it is! I recently found some nice theoretical framework which simplifies its explanation. We will first refer to that theoretical framework. We will then articulate how it applies to digital transformation. Core vs Context is a theory elaborated by Geoffrey Moore. Moore is an organizational theorist. He also is the author of Crossing the Chasm: Marketing and Selling High-Tech Products to Mainstream Customers. There is an online video of Moore presenting that theory. If we look at all the activities a company undertake we can partition them in two ways. The first is core vs context. The second is mission critical vs enabling. Core activities are activities that differentiate our company / product. This is what the market rewards. Core is why other companies / people are ready to pay money for. Context is everything non-core. Every companies need to run mundane services. For instance, maintaining offices, running internal mail, a food court, etc. . Those services might very well be important, but they aren’t core. The reason is that our competitor runs those to. Mission critical is simple enough. When an activity / service isn’t running and we are in trouble instantly, that is mission critical. Everything else is enabling. As Moore argues, we want to invest company’s resource in the top left quadrant, i.e. Mission Criticial – Core. This is where our business wins new customers. This is how the market differentiates us. The top right corner, i.e. 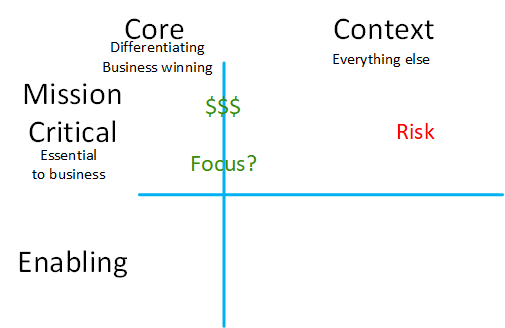 Mission Critical Context, is where the risk lies. Why is there risk there? Since it’s mission critical, it needs investment: the company can’t run without it. That investment doesn’t bring new business though. This is all the “me too” features on a product. Everybody has them, so nobody will choose us because of them, but they could reject us if we don’t have it. In the enabling lane, i.e. 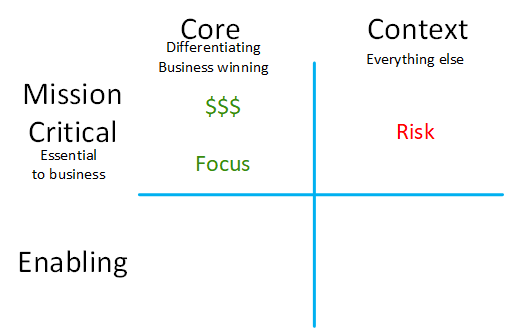 the two bottom quadrants, we need to invest enough to get the business running. This isn’t mission critical though so we have flexibility there. Now this picture is nice and quite prescriptive. The trick is, as time goes by, the middle line moves to the left. The reason for that is that competition is catching up. What differentiated us yesterday is mainstream today. Everyone copied us and there is a new feature which is now popular and we don’t have. So today’s core is tomorrow’s context. The market neutralizes our differentiating factors. The top right quadrant is the graveyard of tech company. Clayton Christensen explains it well in Innovator’s Dilemma. As company and market mature, leaders become followers. In IT, this is true twice if we are first / second mover. This is because our implementation likely isn’t optimal. We jumped on an idea while it was still nascent. We were first so there was no tools around. We developed our own and we became first to market. The market matures and new tools duplicate what we did for half the costs. We are still stuck with that implementation we invested in and we can’t catch up. So what does this framework has to do with Digital Transformation? Change associated with the application of digital technology in all aspects of human society. How do we enact changes with the burden of context investments? Our experience is that legacy processes and technologies prevent companies from innovating. We need to de-risk the context activities. Context activities, by definition, are common on the market. They shouldn’t have “special snowflakes” status inside our walls. They should be streamlined. Doing so will reduce the burden. It will reduce the investment. It will reduce the resources (e.g. staff). 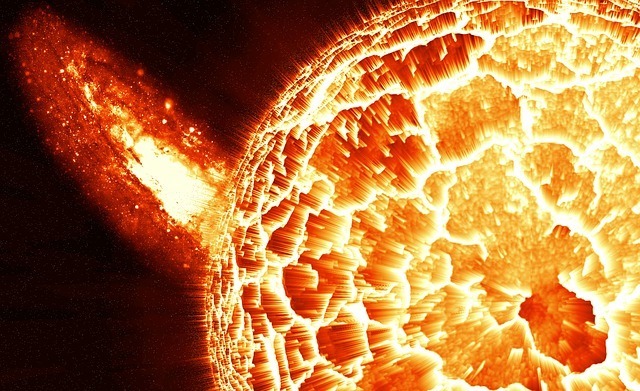 In turn, that will create bandwidth within the company to invest in core activities. This is when we start talking about the cloud since it allows us to do all those. Cloud technologies strive in automation. It is also a great example of automation and standardization. We did the exercise of comparing the cloud with hosting models a little more than a year ago. Standardization was at the core of the differences. SaaS are a great way to simply offload operations to a cloud vendor. IT intensive companies have operation teams around line of business applications. Those teams are keeping the lights on. Instead they could be innovating and creating new value for the company. SaaS products often are a great way to offload entire apps to a vendor. This way we’ll keep what isn’t standard. We can then ask ourselves: should we standardize or can’t we because it’s unique to us? We see a lot of companies using the Cloud to de-risk their context operations. We very often see those companies find it quite easy to then use the cloud to innovate. The cloud opens the door to scenarios which aren’t practical on premise. It also opens the door to exploration in general. For instance, we wonder if there is any value in all that data the sales team have been accumulating. Why not try a Proof of Concept (POC) with Azure Databricks? We can explore if there is value in there and fail fast. We do not need to invest in infrastructure with a risky proposal, we just try it. If it doesn’t work we move on. We found that talking about Digital Transformation in the abstract is interesting. It generates ideas about innovations. But doesn’t generate action. Companies investing a lot in context operation have a hard time innovating. This is why this Core vs Context framework is an interesting way to frame the discussion. It forces us to ask ourselves if we invest resources at the right place. Hopefully this will help you generate good discussions!